The Republican Party has been a force in American politics since the fledgling GOP demanded the abolition of slavery in the 1860 presidential election. They effectively destroyed the Whigs and easily outpaced a floundering Democratic Party that year. Yes, you read that correctly. It was the Republican Party, the party of Lincoln, that fought for a union without slavery. At that point in history, the Democrats argued that the federal government shouldn’t have the power to enforce such widespread policy prescriptions. The lines in the political sand that seem so natural to us today have resulted from an ever-shifting composite of popular policies, turbulent interests and fluctuating political possibilities. No one party has had a monopoly on socially progressive policies or over fiscal conservatism. The Democrats, for instance, became a force to be reckoned with in 1932, when the party ushered in New Deal policies in response to the Great Depression. This sowed the seeds for the Democratic Party as we know it today — a party mainly interested in using government as a tool for social good. The Republican Party changed significantly throughout the Reagan years, accompanied by a shift in its demographic support. The Civil Rights Movement and the Roe vs. Wade abortion rights case resulted in a rise in conservatism, mostly to the benefit of Republican candidates. Conservative Southerners previously aligned with the Democrats swapped sides. The Democratic Party, in contrast, moved to the left and picked up progressive Republicans. We haven’t seen a big political realignment since — until now. Current events, not the least of which has been the ascendency of Donald Trump, have led some pundits to wonder whether we are witnessing the birth of our next political paradigm, a fundamental reworking of what it means to be a Republican, Democrat or in-between. one of the current parties needs to be weak enough to allow for the shift either by making way for a new party or changing its own policies. Schwalbe argued that two of these criteria had already been met. Obama’s victory represented a critical presidential election, while the 2008 recession led to the rise of the Tea Party Movement, evidence of a shift in the electorate. He saw GOP policies then shifting toward the Tea Party ideals. Whether the Tea Party has been diminished or conservative pundits naively mistook populism for right-leaning libertarianism is a matter of great debate. Either way, Trump’s surprisingly successful candidacy and popularity has the mainline GOP concerned. He certainly isn’t interested in the conservative-leaning values the current reincarnation of the Grand Old Party considers central to their existence. He is so far off the mark, in fact, that a number of prominent Republicans have flat-out refused to support him — even if he wins the nomination. (MSNBC is keeping a list.) There has even been some talk of a third-party conservative candidate. And this is where things get interesting. Might the GOP effectively leave the GOP in order to escape Trump? Yet voting Trump may become the only effective way to vote against Hillary Clinton, the presumptive Democratic nominee. It remains to be seen whether fighting the rise of a second Clinton to the highest office in the land will be enough to keep the GOP together. Trump and the GOP aren’t the only wild card this election cycle. The Democratic Party is also coming head-to-head with a renegade, anti-establishment rabble-rouser. Unlike the tenuous assertion that Trump has emerged as the leader of the Tea Party Movement, Vermont socialist and political independent Sen. Bernie Sanders (I-Vt.) hits the nail on the head as the Occupy Wall Street Movement’s unexpected front man. The Republican Party hates Trump despite his sideways nod to conservative ideals. The Democratic Party has no such nod coming from their newest candidate. Sanders has been an outspoken independent for years. Despite running under the DNC banner, his anti-party rhetoric runs deep and has not shifted. The man is literally running as a Democratic socialist, which represents a hard shift from the party’s traditional center-left policy prescriptions. Though the DNC has not directly sided with Clinton, a number of small decisions and oversights have led many to question whether they are undermining the election behind the scenes. Clinton’s overwhelming support from Democratic superdelegates, for instance, is evidence of the party establishment’s disdain for Sanders. Even if Sanders doesn’t win the nomination, he will have successfully shifted the conversation. Since her 2008 bid for president, Hillary Clinton has had to bow significantly to the left on issues such as immigration, education and Social Security reform. Expect more as Sanders keeps his campaign alive longer than anyone might have guessed. Looking back at Dr. Schwalbe’s criteria for realignment, both parties appear well positioned for a change. Watching just how much each party transforms and whether these shifting paradigms realign voters will be well worth a bag of popcorn. Next articleCan A Synthetic-Grass Roof Power Your Home? Hey Buddy!, I found this information for you: "Trump And Sanders Might Change Our Two-Party System Forever". 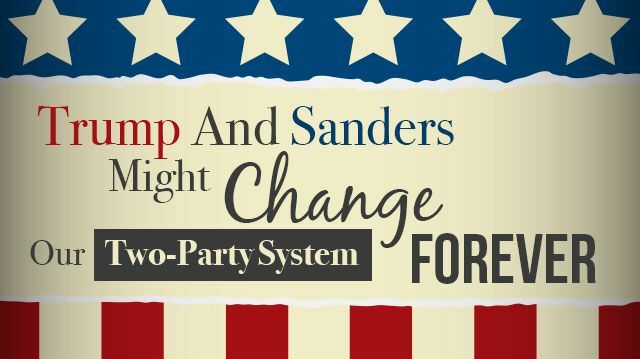 Here is the website link: https://www.thealternativedaily.com/two-party-system-changed-forever/. Thank you.